Today at the American Girl Place at The Grove in Los Angeles, my daughter Jillian and I joined in the celebration for the launch of American Girl's newest historical doll, Rebecca Rubin. Rebecca is a nine-year-old Jewish girl growing up in New York City in 1914, at the height of America’s immigration era. Today's celebration included a themed brunch, arts and crafts, prize drawings, lots of photo opportunities and more. The first 100 customers received a goody-bag of American Girl items, including trading cards, puzzles, a Rebecca poster, and an American Girl magazine. 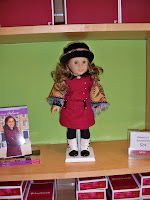 American Girl Place is a destination spot for girls and their parents. The enthusiasm in the air is contagious. The excitement begins before entering the store. The fantastic window display shows Rebecca in each of her outfits in different scenes in huge doll house. Inside the store each doll has a section with historically accurate details. 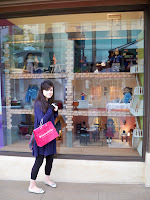 American Girl Place is as much a museum as a store, combining educational elements with good old fashioned fun! There are more events coming up in June to continue Rebecca's launch. The window display will be at the store until September. Be sure to visit http://www.americangirl.com/ for more details. ***Visit the blog tomorrow to meet Jacqueline Dembar Greene, author of the Rebbeca books! Libi Astaire is an author and freelance journalist who lives in Jerusalem. She is a frequent contributor to Mishpacha Magazine, an international Jewish weekly magazine, where she writes about Jewish history and art. The Disappearing Dowry is her first book to be published. Ms. Astaire grew up in Prairie Village, Kansas. She is a graduate of the University of Michigan, Ann Arbor, where she received a degree in Theatre, English Literature, and European History. She also received an M.B.A. in Marketing and International Business from New York University’s Stern School of Business. I was excited to speak with Libi about her fascinating debut historical novel. The Disappearing Dowry is the first book in a new historical mystery series that’s being published by Zahav Press. The setting is London during the Regency period, which is a very popular era thanks to the books by Jane Austen. What makes “Dowry” unique is that it’s about London’s Jewish community - it’s a kind of “Jane Austen meets Sherlock Holmes,” but with a Jewish twist. In The Disappearing Dowry readers get to meet my detective, Mr. Ezra Melamed, who is actually a wealthy benefactor of the Jewish community. Because he’s recently been widowed, he’s looking for something that will give new meaning to his life. He finds it when a fellow member of London’s Great Synagogue, Mr. Samuel Lyon, has his money stolen - including the dowry money for his eldest daughter, Hannah, who has recently become engaged. So Mr. Melamed’s mission is to restore the stolen money before the groom’s family finds out that Mr. Lyon has been financially ruined and they call off the wedding. I’ve always loved history and I’ve always loved reading mysteries, so the decision to write a historical mystery was a natural one. The decision to set the series in England was a natural one for me, as well, even though I grew up in Prairie Village, Kansas. For some reason, when I was young I was a big fan of everything English – the history, the literature, the idea of having afternoon tea. I remember the first time I asked a waitress at a Prairie Village restaurant for tea with milk, which is how the English drink it. Her eyes nearly popped out of her head. She didn’t know if I was pulling her leg or if I was out of my mind. But to get back to your question, I was really looking forward to finally making use of this great storehouse of English trivia that I had accumulated over the years, and I just had to decide what time period to set the story in. I chose the Regency period because it’s an era that’s brimming with life and offers all sorts of possibilities for an author. The Napoleonic Wars are going on in Europe, the Industrial Revolution is just starting, and fortunes are being made and lost overnight on the London Stock Exchange. It’s also a very interesting time for the Ashkenazic Jewish community, which is only just beginning to establish itself both socially and financially. So I loved the fact that there would be so many different ways to develop the series and create interesting complications for the characters. Was a lot of research involved? Yes, but it was definitely a labor of love. It was very important for me to be able to visualize the details of my characters’ lives – where they live, how they dress, what they do with their time, etc. - so that I could create a world that would be convincing for the reader. I was really happy when I came across a very detailed street map of London that was from the period. I knew, of course, that the center of Ashkenazic Jewish life was the Great Synagogue. But even though that narrowed things down considerably, I still sat with the map for hours trying to decide things like what street the Lyon family should live on, and where was the best location for Mr. Lyon’s fashionable clock-making shop. Then I had to research the women’s dresses – including Hannah Lyon’s wedding dress - which was a great deal of fun to do. And, of course, I had to find out what was happening in the year that the story takes place. I chose to set the story in the year 1810 after I discovered that there was a financial panic in the summer of that year and many banks failed. That struck a sympathetic chord, after what’s happened to the world economy during the past year. What is the most interesting thing you learned in the process of writing the book? Listen to your editors! When we were first discussing the book, the editors were concerned that it was going to be too male-oriented because it has a male detective and Mr. Lyon is a central character. I didn’t think it would be a problem, since Mrs. Lyon and Hannah Lyon are also very important to the story. But I guess something from the conversation stuck in my brain, because a few days later I woke up to the “voice” of a “young lady” babbling in my ear. I’m not a morning person, so I just turned over and went back to sleep. But this “young lady” was persistent. She came back the next morning, and the one after that, as well. I finally figured out that she was Hannah Lyon’s younger sister and that she wanted to be the narrator of the story. So that’s how the character Rebecca Lyon entered the picture. And I’m very happy that she did, because it’s her “young Jane Austen” voice that sets the tone for both this book and the entire series. I live in Jerusalem and so I do have to say that every holiday here is wonderful. But my personal favorite is Succos. Most people have off from work for the entire week and so during the day everyone goes visiting each other’s succah, while at night there are music concerts in all the neighborhoods. Of course, everyone tries to make at least one trip to the Kosel (Western Wall), and so the plaza area is packed day and night. And because Succos is zman simchoseinu – the time of our joy – everyone is in a really good mood, which is a pleasure to see. But it’s also very nice to sit quietly in the succah with a cup of tea and just enjoy having the very great privilege of living in this very beautiful, very amazing city. Libi, thank you so much for sharing your journey of The Disappearing Dowry. Libi’s novel about modern-day descendents of crypto-Jews living in Catalonia, Terra Incognita, is scheduled to be published by Targum Press in the Fall of 2009. Association of Jewish Libraries Serves Up Authors at Sheraton Chicago on July 7(Chicago – May 20, 2009) Teachers, librarians, educators and booklovers are invited to attend a gala Jewish Author Luncheon on Tuesday, July 7, 2009 at the Sheraton Chicago Hotel and Towers at 12:00 noon. The event will feature over thirty-five authors and illustrators who create books for adults and children. A book signing and reception will follow the luncheon, which is being held in conjunction with the annual Association of Jewish Libraries (AJL) national convention.During the luncheon and reception, authors and illustrators will circulate among the attendees to highlight their works, ranging from children's picture books, adult fiction and non-fiction, poetry, and short stories to cookbooks and scholarly works. Several of these authors will also present sessions during the AJL convention. On Monday, July 6, Esme Codell (Vive La Paris, Hanukkah Shmanukkah), Ilene Cooper (Sam I Am, Jewish Holidays All Year Round), Brenda Ferber (Jemma Hartman, Camper Extraordinaire, Julia's Kitchen), and Esther Hershenhorn (Chicken Soup By Heart) will explore "Writing the Jewish Children's Book" and Simone Elkeles (Perfect Chemistry, How to Ruin My Teenage Life) will discuss "Bat Mitzvah & Beyond: Jewish Girls Coming of Age in Fiction." On Tuesday, July 7, Peter Ascoli will speak about his book about his grandfather, Julius Rosenwald: The Man Who Built Sears, Roebuck and Advanced the Cause of Black Education in the American South.Local authors will be joined by authors and illustrators from across the United States and Israel. Richard Michelson (Northampton, Massachusetts) and Raul Colon (New City, New York), author and illustrator of As Good As Anybody: Martin Luther King, Jr. and Abraham Joshua Heschel's Amazing March Toward Freedom, the 2009 Sydney Taylor Book Award Winner for Younger Reader, Aranka Siegal (Williams Island, Florida), author of Memories of Babi, the 2009 Sydney Taylor Honor Award Winner for Older Readers, and Anna Levine (Jerusalem, Israel), author of Freefall, the 2009 Sydney Taylor Honor Award Winner for Teen Readers, will all present during sessions on Tuesday, July 7 and will also be recognized during the awards banquet on Tuesday evening. Pearl Sofaer (San Francisco, California), author of Baghdad to Bombay: In the Kitchens of My Cousins, will speak about the gems of Mizrahi liturgy on Monday, July 6. 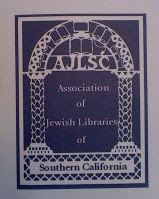 "The AJL convention will draw over 200 Judaica librarians from synagogues, day schools, community centers, seminaries, universities, and research institutions from across North America and around the world," explains Rachel Kamin, a member of the local planning committee and chair of the Jewish Author Luncheon. "We want to showcase and celebrate the wealth of Jewish literary talent in the metropolitan Chicago community during the convention. "Tickets for the Jewish Author Luncheon and Reception are available for $75.00 and include an elegant kosher meal and delicious dessert reception. Copies of the participating authors' works will be available for sale. To purchase tickets, or for more information about the Association of Jewish Libraries and its Chicago convention, contact Marcie Eskin atmjeskin@comcast.net or (847) 676-1480, or visit www.jewishlibraries.org. Dina (Devorah Leah) Rosenfeld has written over 18 Jewish books for children including the classic, The Very Best Place for a Penny, the beloved Labels for Laibel, and Five Alive, an AJL notable book for 2003. She lives in Crown Heights, Brooklyn, with her husband and children. Dina's newest book is All About Us. Tell me about All About Us. All About Us is a deceptively simple preschool picture book that highlights all the mitzvot (good deeds) that can be done with different parts of the body. Having taught in a Jewish preschool, I always wanted to provide a Jewish twist to the curriculum. Every nursery school presents a unit on the parts of the body, and All About Us addresses the subject from a uniquely Jewish point of view. According to Jewish tradition, the entire world was created according to the blueprint of the Torah, with the performance of mitzvot as the ultimate goal. From that perspective, it's not just a nice idea to use your hands to open the door for a guest or to light Shabbat candles. The ability to perform those acts is the very reason we needed to have hands in the first place! As a preschool teacher, I wanted to challenge myself to present this rather advanced esoteric concept to my three-year-old students in a completely age appropriate way. It's purely in the "mulling over" stage right now, and in my experience, an idea made public before its time somehow never works. What is the best part about being a children's writer? Your fans always read your books cover to cover, and sometimes, they know every word by heart! How many famous novelists can say that? But the best part of being a children's writer specifically for the Jewish market is the possibility that the books will actually affect children's attitudes and behavior... increasing their awareness and practice of Judaism in a meaningful way. Dina, I wish you continued success with your books! Thanks for stopping by. 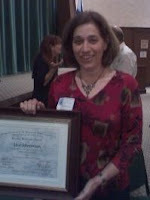 Congratulations Lisa Silverman - Librarians Rock! Last night Lisa Silverman was honored with the Dorothy Schroeder Award by the Association of Jewish Libraries of Southern California. Lisa is the director for the Sinai Temple Blumenthal Library. She is also the Children's Editor for Jewish Book World Magazine and along with Susan Dubin hosts the annual Jewish Literature for Children Conference every year. I have had the pleasure of working with Lisa and am honored to call her a friend. The event was held at the lovely Sinai Temple. Rabbi David Wolpe gave an inspiring speech about the spiritual nature of books and reading. Lisa was presented with her award and gave a charming talk about her journey as a librarian. It was a wonderful evening, a great opportunity to see old friends and meet a few new ones. Most of all, I was delighted to be part of the warm reception for a well deserving member of our community. If you are looking for some fabulous items, including manuscript critiques, original illustrations, signed books, and more, please check out the auction for Bridget Zinn, a children's book writer who is fighting cancer. Jone MacCulloch is the organizer of the Bridget Zinn Auction. Hedi Estrin at The Book of Life Podcast interviewed Jone about Bridget and the auction created on her behalf. Ventura Museum Features "The Magic of Children's Books!" If you would like to meet some of the authors and illustrators in person, stop by on May 17th. Alexis O'Neill, Carol Heyer, and Jody Fickes Shapiro will be featured. Book signing will be available and art activities are also planned. The event is from 1:00-3:00. Best of all, it's free! 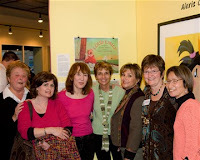 Many local supporters, including SCBWI members, helped to celebrate the opening of "Picture This! The Magic of Children's Books." The photo above features Jean Castaing, Barbara Bietz, Eloise Freeman, Dianne White, Tina Nichols Coury, Alexis O'Neill, and Yuki Yoshino (courtesy of Jean Castaing).